Chief has a 40-year heritage of innovation, developing inspired solutions for the workspace, conferencing environments, corporate digital signage and beyond. We’re driven to develop functional products with aesthetic designs that support beautiful, ergonomic spaces and transform the way people work. At the core of our workspace solutions is the Kontour Series: elegantly designed monitor arms that create efficient, ergonomic workspaces that improve employee wellness and increase productivity. Designed with the strength of a forged aluminum body, Kontour monitor arms offer a broad scope of benefits, like extreme fingertip tilt adjustment, easy installation and stylish design at a great value. Kontour KX reduced depth monitor arms optimize workspace for dual-, triple and quad-monitor installations. 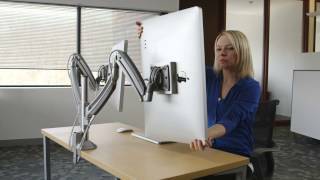 Kontour K1 monitor arms create flexible, ergonomic workspaces in a wide variety of settings. Shown: K1C220SXRH with KRA330 laptop tray accessory. K1 Series monitor arms are powered by a gas cylinder arm for dynamic height adjustability. Shown: K1C220SXRH with KRA330 laptop tray accessory. Reduced height models are available to accommodate bi-focal glasses, or to meet ergonomic needs. Shown: K1C220WXRH. The K1 Series monitor arms are available in subtle black, silver and white finishes. Shown: K1D120W. The Kontour K1 Series includes monitor arm solutions for desk, wall, slat wall and pole applications. Shown K1W120W. Support multi-monitor array applications with Kontour K1 Series monitor arms. Shown K1C420S and K1C330S. The Kontour K2 Series monitor arms provide a heavy-duty solution while maintaining style and ergonomics. Shown K2C22HS. Kontour K3 static array mounts meet a wide range of monitor sizes and configurations and are available in black or silver finishes. Shown K3F310. 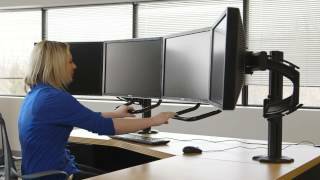 Optimize the depth of dual-, triple- and quad-monitor installs with Kontour KX Series monitor arms. The exclusive FleXlink design maximizes workspace in shallow desk environments while still providing full range of motion for screen sharing with colleagues. 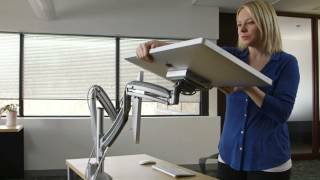 Kontour Series K1 monitor mount arms create flexible, functional workspaces in a wide variety of settings. The gas cylinder arm powers the K1 mount with dynamic height adjustability. Heavy-duty Kontour Series K2 monitor arms provide strength, style and ergonomics. 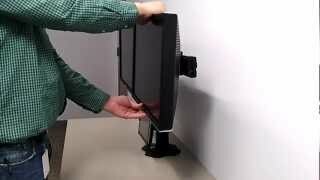 Monitor heights can be adjusted on desk models by sliding the arm vertically along the column. Kontour Series K3 and K4 monitor array mounts provide strong, safe support for multi-monitor applications and focal-depth adjustment to let multiple users re-position the bank of screens to their preferred viewing distance. Individual ergonomic differences demand a desk system that adjusts to the user. Keyboard and mouse support systems allow users to raise, lower, push, pull and pivot the keyboard and mousing tray to meet their individual position requirements. The result is better ergonomics and injury prevention. Users work most efficiently when comfort and ergonomics are maximized. Work that requires precision mousing, such as many engineering and design tasks, significantly benefits from solutions that provide an adjustable mouse surface that articulates, tilts and swivels. Chief’s range of keyboard systems provide better placement of the keyboard and mouse for sitting, standing or moving between the two. As part of the Legrand family of AV brands, Chief’s line of workspace solutions has expanded to include Desktop Power Centers and radiant® Furniture Power Centers. Both put power within reach while blending in to today’s modern office aesthetics. Chief’s Desktop Power Centers are available with two or three AC outlets and two USB-A ports in either black or white with gray finish options. Shown: KRADPC32B, fixed mounting. All Desktop Power Centers ship with both clamp and fixed mounting hardware, and a 6’ (183 cm) power cord with pass-thru plug. Shown: KRADPC32W, clamp mounting. Chief’s Desktop Power Centers are engineered by our parent company, Legrand. Shown: KRADPC22W, fixed mounting. Desktop Power Centers provide 2 or 3 AC outlets along with dual USB-A ports for convenient charging – perfect for desks, tabletops and workstations. These sleek and easy-to-install solutions mount directly on surfaces and minimize cord clutter. All models ship with hardware for both clamp and fixed mounting. Available in two finish options: black or white with gray. Convert nearly any piece of furniture into a sleek and modern charging station with radiant® Furniture Power Centers. This innovative design combines the functionality of USB with traditional power for convenient charging in training rooms, conference rooms, hospitality furniture and other spaces. The flush mounted form factor provides 2 AC outlets and dual USB-A ports while blending in with décor to bring your furniture a step above ordinary. Available in white and nickel finishes. Keep up to date on all the latest product, trade show and other Chief news with our convenient monthly email newsletter. Chief's Kontour Series K3 array mounts are packed with flexible adjustment features to support just about any workspace configuration. Watch as the 3x1/2x1 model extends, slides, tilts, detaches and reattaches to suit a multitude of monitor and tablet combinations.